Posted By:Unknown | At:9:36 AM Be the first to comment! ORLANDO (AP) - Four students who were expelled from Florida A&M University for their role in what is believed to be the hazing death of a marching band member have returned to classes because the investigation is not finished, school officials said Wednesday. The status of band director Julian White also changed. He had faced termination Dec. 22 but is now on administrative leave with pay, FAMU attorney David Self said during a break in meetings of the school's board of trustees in Orlando. The Florida Department of Law Enforcement asked the university to stop any disciplinary action until a criminal investigation into the death of Robert Champion is done. Detectives say hazing played a role in his Nov. 19 death. He died aboard a band bus following a football game against rival Bethune-Cookman University. Witnesses said he vomited before becoming unresponsive. "According to the FDLE letter, all disciplinary action had to cease," said Henry Kirby, dean of students. White's attorney called the change "a step in the right direction." He said White would seek full reinstatement as band director and as a fully-tenured music professor. "We still intend to explore all the legal options in light of the university's collective bargaining agreement and Dr. White's contract," said Chuck Hobbs. 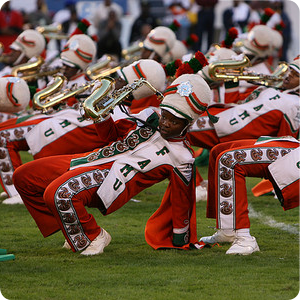 The famed Marching 100 band has been shuttered as the death is investigated by the Orange County Sheriff's Office, the FDLE and Florida's higher education governing body, the Board of Governor. An attorney for that board told trustees that Champion's family had sent a letter indicating they plan to sue over his death. The letter requested the Tallahassee-based university's insurance information but it didn't make reference to any individuals or legal theories that they may follow, said attorney Rick Mitchell. Mitchell said Florida law limited the board's liability to $300,000, although individuals could be liable for a larger amount if they were found to have acted in bad faith, with malicious purpose or exhibited wanton disregard for safety. Board members didn't address the future of James Ammons, the university's president, but left open the possibility it would be a topic of discussion Thursday. Board chairman Solomon Badger said he supported Ammons, but other board members, when asked, refused to say whether he had their backing. Ammons told reporters he wasn't thinking about his future. "The university is much bigger than James Ammons," he said. "I'm not focusing on whether I have the support of the board. My focus right now is on this family who has lost a son and on this university, and how we're going to move forward and repair the image of the university."